That seems reasonable, right? Yes indeed. On the other hand, it seemed reasonable for centuries to think that the sun revolves around the earth. All the textbooks said so. There is just one way to tell whether what seems reasonable is factual: scientific testing. When it comes to testing the accuracy of Vaticanus and Sinaiticus, we have a problem: what shall one use as the standard of comparison? If the Nestle-Aland Novum Testamentum Graece is used, there is a problem: the Nestle-Aland compilation is the same as the UBS compilation; the UBS Greek New Testament’s Introduction acknowledges that its editors began “on the basis of Westcott and Hort’s edition of the Greek New Testament,” and Westcott and Hort (back in 1881) acknowledged that they esteemed Vaticanus and Sinaiticus so highly that they (the editors) were willing to reject their agreements only tentatively, even when their readings opposed all other Greek manuscripts. So there is a bit of a circularity problem when an echo is used as the standard by which to measure the quality of the voice from which it came. Another option might be to use the Robinson-Pierpont Byzantine Textform as the standard of comparison – but then the objection would arise that such a standard would give an unfair advantage to the medieval manuscripts. 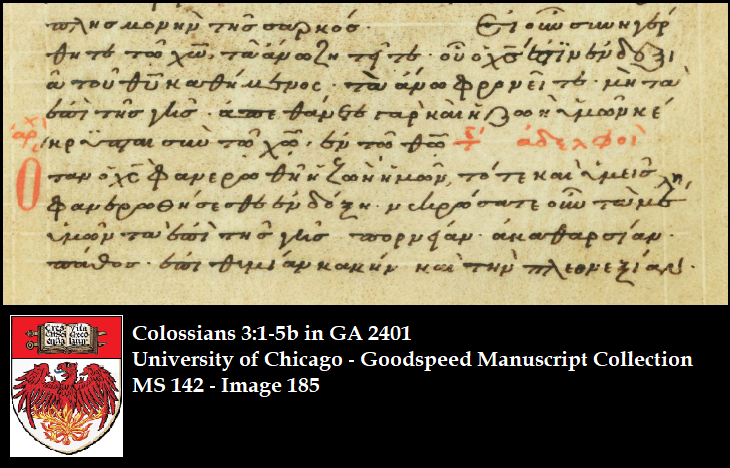 So, acknowledging the echo-problem, let’s put Vaticanus and Sinaiticus and two medieval manuscripts in a boxing-ring – today we leave the usual arena in the Gospels, and turn to Colossians 3:1-11 – and see which manuscript’s text is more accurate. The two medieval manuscripts going up against the two “oldest and most reliable” heavyweights are minuscule 6 and minuscule 2401. Let’s take a brief look at the medieval challengers. Minuscule 6 has a distinguished history: it was one of the collection of manuscripts cited by Stephanus in his printed Greek New Testament in 1550/1551. Its production-date is not certain; in the 1800s, Scrivener consider it to be from “xi or later” but the production-date given in the Nestle-Aland Introduction is “XIII” – the 1200s. Stephanus cited it as witness #5 (“ε′”). The Nestle-Aland compilers gave it special treatment, listing it as a “Frequently Cited Witness” in Acts and the Pauline Epistles. It is one of the few manuscripts that does not include the words “in Ephesus” in Ephesians 1:1. The description of minuscule 6 in Scrivener’s Plain Introduction (1894 edition) is brief: “In text it much resembles Codd. 4, 5, and 75. 12mo, 5½ ´ 4½, ff. 235,” – supplemented by book-prologues, chapter-lists, chapter-numbers in side-margins, chapter-headings, Eusebian section-numbers in the margins in the Gospels, and a liturgical calendar of lections with St. Chrysostom’s liturgy; the writing-material is parchment. Scrivener continues: “This exquisite manuscript is written in characters so small, that some pages require a glass to read them.” Robert Waltz provides some additional information about MS 6 at the Encyclopedia of New Testament Textual Criticism, including the observation by Wisse that 6’s Gospels-text is affiliated with a subgroup of family-Π. I would say, too, that some parts of its text have a special closeness to the text of 1739. 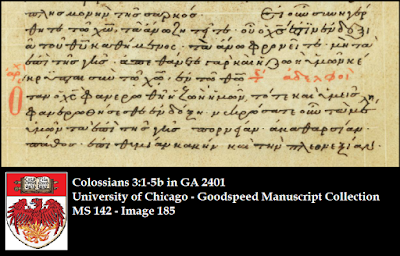 Minuscule 2401 is part of the Goodspeed Manuscript Collection at the University of Chicago, where it is nicknamed “The Theophanes Praxapostolos.” It was produced in the 1100s. In addition to the books of Acts, the Pauline Epistles (including Hebrews), and almost all of the General Epistles (pages from Second Peter are missing), it has book-summaries (part of the Euthalian Apparatus) and stichoi-counts. It looks like the Nestle-Aland compilation is practically a transcript of Codex Vaticanus, until we reach verse 7. That’s a significant non-inclusion. (The NIV, by the way, presently does not include επι τους υιους της απειθειας in its base-text; the reading is only mentioned in a footnote.) The variant in 3:8 is an orthographic triviality, so we can conclude that Vaticanus contains 25 letters’ worth of non-trivial variation from the Nestle-Aland compilation in Colossians 3:1-11. Let’s see if Codex Sinaiticus’ text is better. Sinaiticus has some corrections in this passage and it is not easy to tell with complete confidence whether or not a correction was made before the manuscript left the scriptorium, or at some later time. I will simply follow the main uncial text, and mention the corrections. This yields 21 letters’ worth of non-trivial variation. Together, Vaticanus and Sinaiticus contain 46 letters’ worth of non-trivial variation in Colossians 3:1-11. Now let’s look at this passage in minuscules 6 and 2401.
which yields 6 non-original letters and 9 missing original letters, for a total of 15 letters’ worth of non-trivial variation (or less, depending on whether or not της is in verse 2 and depending on whether the α in απεκδυσαμενοι is there or not). Now let’s turn to our final combatant. There are no trivial readings in Col. 3:1-11 in 2401, so the raw data and the final totals are the same: its text has 6 non-original letters, and is missing 18 original letters, for a total of 24 letters’ worth of non-trivial variation. This little two-on-two contest does not verify the popular axiom “The older the manuscript, the better the text.” Vaticanus is slightly older than Sinaiticus, and both Vaticanus and Sinaiticus are at least 600 years older than minuscule 6. Yet, using NA27 as our proxy for the original text, the young minuscules 6 and 2401 introduce, combined, only 39 letters’ worth of non-trivial deviations from the original text, while ancient Vaticanus and Sinaiticus introduce 46 letters’ worth of non-trivial deviations from the original text. Thus, in Colossians 3:1-11, the Byzantine Text, with six non-original letters present and three original letters absent, is closer to the original text than any of the manuscripts in today’s contest – if the Nestle-Aland compilation, which relies heavily on the “the most reliable manuscripts,” is used as the standard of comparison. Great work, James! Sad to see the Byzantine compilation not given an equal footing by the consensus.